UCLA starts spring practice Tuesday, April 4, looking to fill about half of its defensive starting positions. The Bruins lost impact players on every level of the defense, from potential first-round edge rusher Takkarist McKinley, to the Pac-12’s leading tackler Jayon Brown, to shutdown corner Fabian Moreau. Here’s a position-by-position look at what the Bruins are losing and who might step up this month to grab a starting spot. Each position group has two pie charts. 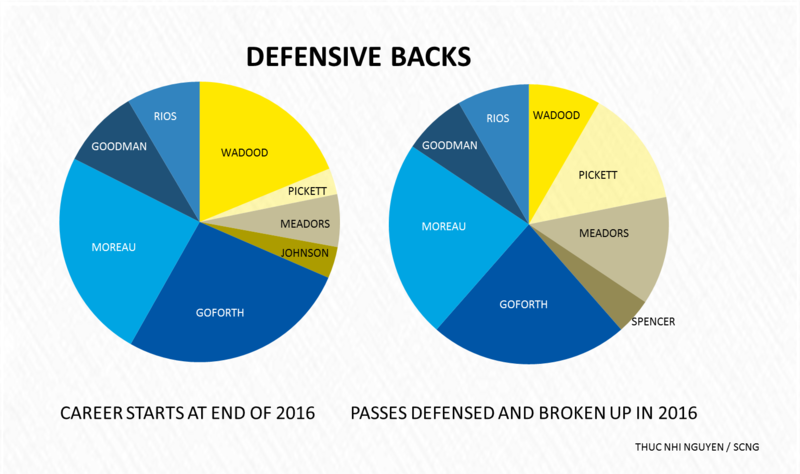 The yellow slices of the pies reflect production from returners, while the blue slices represent production from graduating seniors. The defensive line loses the most out of any group as three-fourths of its starters are gone. The only players remaining with starting experience are Matt Dickerson and Jacob Tuioti-Mariner, who will both be seniors next year. 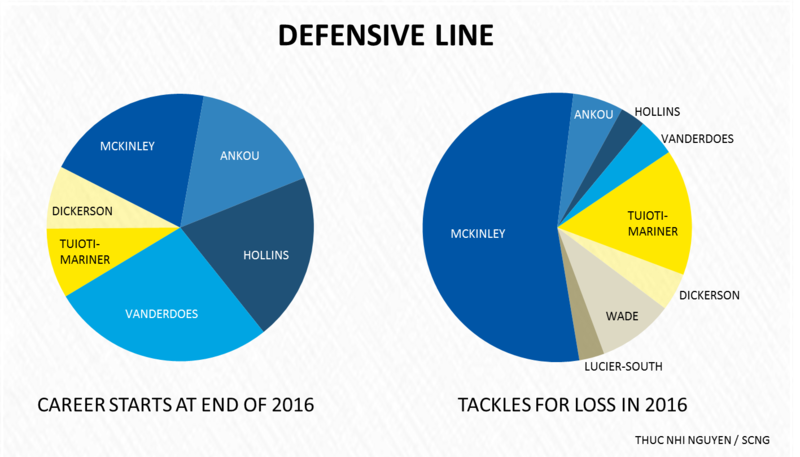 McKinley, Vanderdoes, Hollins and Ankou accounted for 68.2 percent of the defensive line’s tackles for loss last year, led by McKinley’s team-high 18 tackles for loss. Despite losing a lot, the Bruins still have some depth at defensive line. Sophomore-to-be Boss Tagaloa is not represented in the above charts, but he played in 12 games off the bench last year and could be in line to start this year. He had 19 tackles last season (none for loss). Tuioti-Mariner leads the returners in production with five tackles for loss and 46 total tackles. His five tackles for loss was the second-most on the team. Incoming freshman Jaelan Phillips will likely see significant time also as the Bruins look to fill McKinley’s edge rushing position. Keisean Lucier-South flashed some potential, but still had a ways to go in terms of weight. He was listed at 225 last year as a redshirt freshman and his eventual target weight is 255. Brown’s Pac-12 leading 120 tackles is a very big loss for the Bruins as he contributes both on defense and special teams. He racked up 43.3 percent of UCLA’s tackles by linebackers. 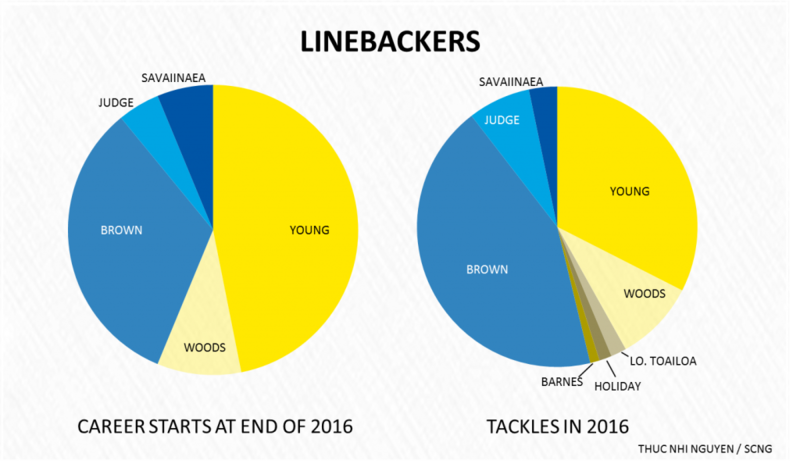 Brown is UCLA’s only major loss among the linebackers as Judge and Savaiinaea were limited contributors on defense. (Judge was an important special teams player, though.) Kenny Young is the second-most experienced returner on the defense with 30 career starts entering his senior year. The Louisiana native will likely be the centerpiece of UCLA’s linebacking ground this year. He had some great stretches last year, but struggled toward the end of the season, especially when reading blocks in the running game. Josh Woods is also primed for a breakout season. Defensive coordinator Tom Bradley often says Woods will be a good football player “one day.” Perhaps that day will come this year. Lokeni Toailoa didn’t crack the rotation as a freshman, but will likely get more playing time this season. 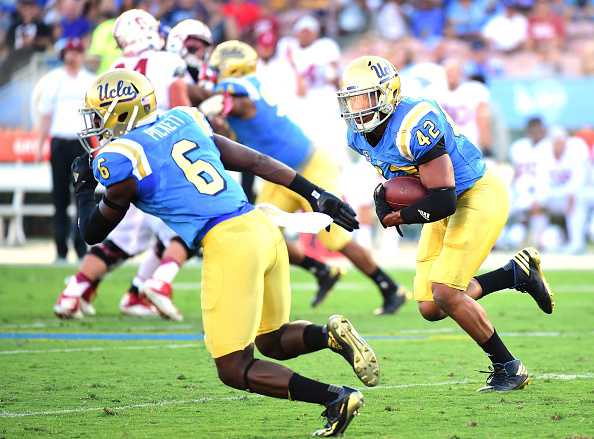 Moreau came to UCLA as a three-star running back, but left as one of its best cornerbacks. He had 22 combined passes defensed and broken up last year, which was tied for the team lead with Goforth. The secondary is set to reload, led by Jaleel Wadood, whose 31 starts makes him the most experienced returner on the UCLA defense. Adarius Pickett was one of the stars of the secondary last year, earning his first career starts and finishing second on the team in interceptions with three. Wadood and Pickett could make a very good safety tandem for the Bruins. Brandon Burton made occasional appearances on special teams as a freshman, but could crack the two-deep this year. With one of the best defensive back recruiting classes in the country, UCLA could also see freshman vying for playing time. Five-star recruit Darnay Holmes and four-star Elijah Gates are the top freshmen in the secondary. The Bruins are looking for a starting cornerback opposite Nate Meadors. This entry was posted in Football and tagged spring football by Thuc Nhi Nguyen. Bookmark the permalink. Well Bruin FB fans, we have to hope JimmyBall finds the time to know the 2017 UCLA FB team. You sound so lame with your whole JimmyBall thing. Have you not noticed to one has gotten on board. Great attitude to start the season btw. Lame is in the eye of the beholder. I’m betting you’re one of the Bruin whiner’s that blame the Bruin’s 4 – 8 record just on Rosen’s injury. With Rosen, the Bruins would have been won 3-4 more games last season and gone to a lower tier bowl. Underachievement in any event. Disagree, Rosen was hurt due to the lack of protection by his own inferior O/L; an O/L stitched together by Mora. It’s fairly conclusive that 99 of 100 QB’s are merely average to below average w/o a decent O/L. Whether or not a semi-healthy Rosen would win 3 or 4 more UCLA games last year is highly debatable. It seems early to worry about the defense when we don’t even know who is playing in the nba next year. After several years of unrealistic expectations formed from optimistic Spring coverage, I’m going to wait until the season starts to see if there’s any reason to get my hopes up. Fabian Moreau was not a “shutdown corner” while in Westwood. What’s the deal with Mique Juarez? Are we done baby sitting?